Keeping a diary, journal or log can assist you in many ways. You can use them to gain better insight to yourself, which can help you solve issues such as relationship problems or emotional concerns. They can be tools to help you focus on tasks and achieve personal goals. Keeping a journal can spur your creativity or record your memories and milestones in life. To get the most from journaling, first decide what you hope to gain from doing so and then select the type of form that best suits that objective. Determine whether you prefer to have a physical log that you can carry with you or would rather sit quietly at your computer and type in details. Once you have selected a template and established an approach, the key to successful journaling is consistency. As long as you faithfully chronicle pertinent information, you are sure to benefit from the experience. Browse through the following journal templates below to find one that meets your needs. Click on any image to view an enlarged version of it. When you discover one that you would like to use, click the Download Page link in the References and Resources section at the end of the article. There you can download the template to use in or print from Microsoft Word. 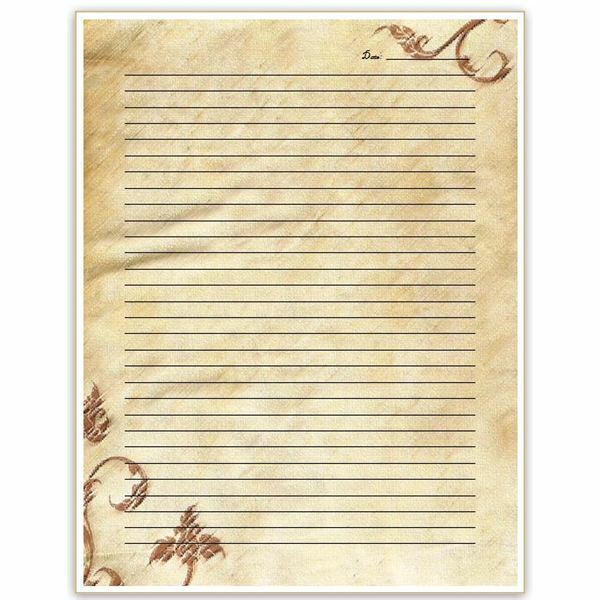 The first traditional journal template for Microsoft Word features a background that resembles parchment paper with a brown, scrolling floral design in the upper right and lower left corners of the page. There is a date line at the top right side of the page. 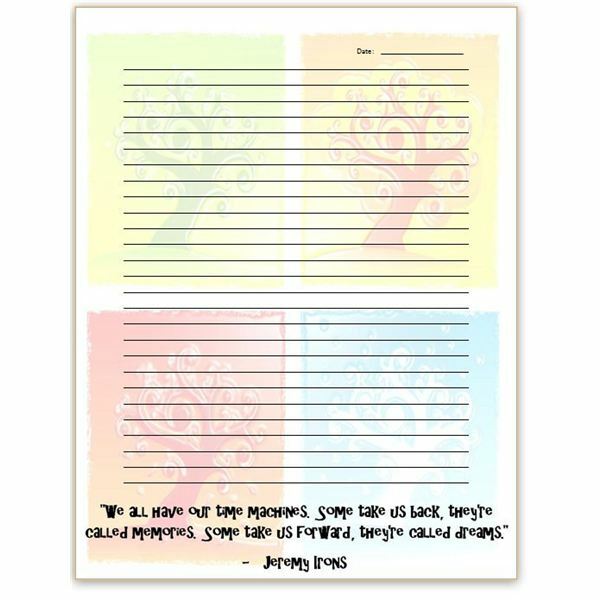 The remainder of the page contains a table that provides lines onto which you can write your thoughts and feelings. The table also makes it easy to type directly onto the page, should you prefer to keep your journal in Word. If you prefer to write about your day while enjoying a hot cup of coffee, the next template might be more your cup of tea. 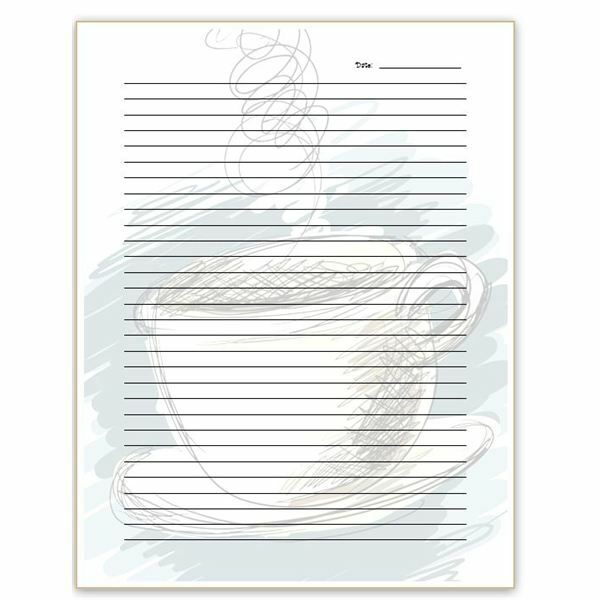 With the same type of lined table and a corresponding date line, this page includes a background image of a fanciful, scribbled, steaming mug. Sometimes a thought-provoking quote can inspire you to write creatively. The next option offers an artistic background image of a tree throughout each of the four seasons. At the bottom of the page is a quote by Jeremy Irons: “We all have our time machines. Some take us back, they're called memories. Some take us forward, they're called dreams." The fourth and final traditional diary page offered here is one that a younger lady might prefer. The background appears as a page filled with doodled stars in varying sizes. Among the stars, the words, "Hopes," "Dreams" and "Wishes" are written at different angles. A lined table makes for easier journaling, and there is a place to jot down the day and date in the upper right corner. Remember to scroll down to the References and Resources section at the end of the article to download any of these templates. As previously stated, there are countless reasons to journal. If you are hoping to track something other than simply your day-to-day musings and experiences, one of the following templates might match what you seek. For instance, not all journaling is achieved in the form of words. If you would rather sketch than speak, check out this art journal page. It features three different shapes with diverse borders in which you can doodle and draw. 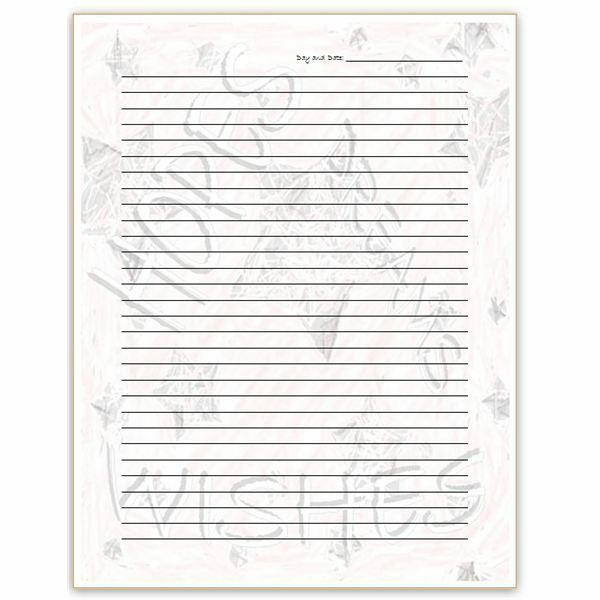 In addition, WordArt objects decorate the page with the words, "Create," "Sketch" and "Draw" in an assortment of sizes, fonts and colors. Recording your dreams can be therapeutic, help you become more perceptive and even boost your problem solving skills. Keeping this form on a bedside table allows you to jot down nocturnal visions before you even roll out of bed. There are spaces for the day and date, the times that you went to bed and woke up, as well as lines on which to write details of your dreams and your interpretations. The background features a childlike image of a girl climbing a ladder up to a starry sky. improve your health and physical fitness? Then the next two templates might be just what the doctor ordered. First is an exercise log that features two columns. The left side contains sample fields for easy journaling, such as "Type of exercise" and "Duration." The cells in the right side of the table are empty, so that you can type or write in your information. The form is in hues of red, but you can change the table's appearance if you choose. 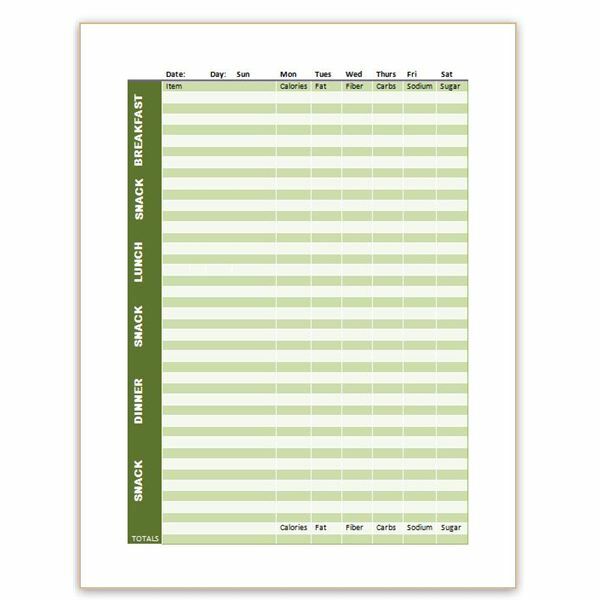 Similarly, the food log form provides sections for breakfast, lunch and dinner as well as snacks. There are fields for you to list each item you eat or drink as well as the calories, fat, fiber and other nutritional values for all of your meals and munchies. There are places to tally up these numbers at the bottom of each column as well, so you can make sure you are reaching your nutritional goals. As with the red tones of the previous template, you can change the shades of green to something else, should you choose to do so. Keeping an account of your prayer requests and how they were answered can help you grow in your faith. 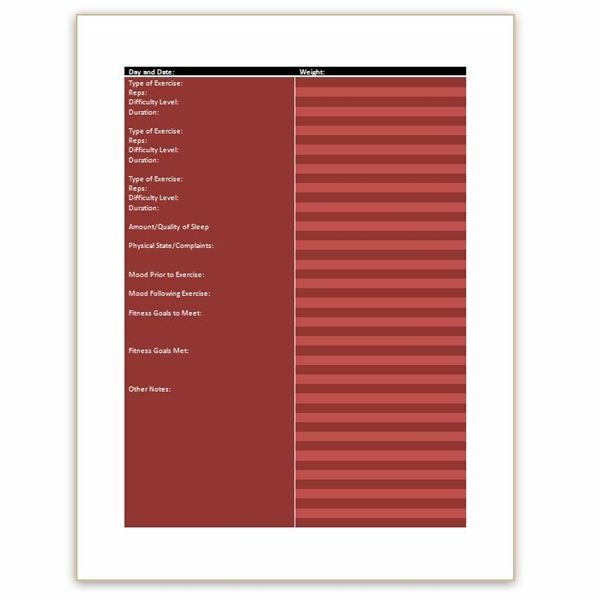 This template makes it simple to list concerns when family and friends bring them up, so that you can remember to pray for them as well. 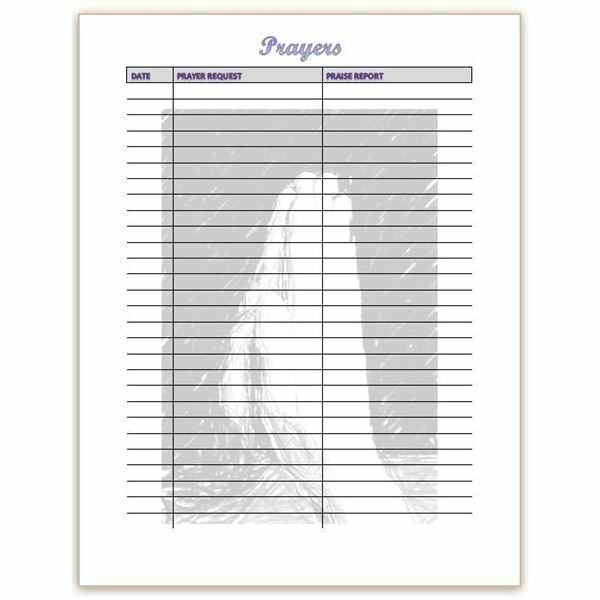 The form features columns for the initial date and details of each prayer in addition to a column where you can record "praise reports." A sketched pair of clasped hands decorates the background. What time in a woman's life is more precious and sacred than when she is with child? 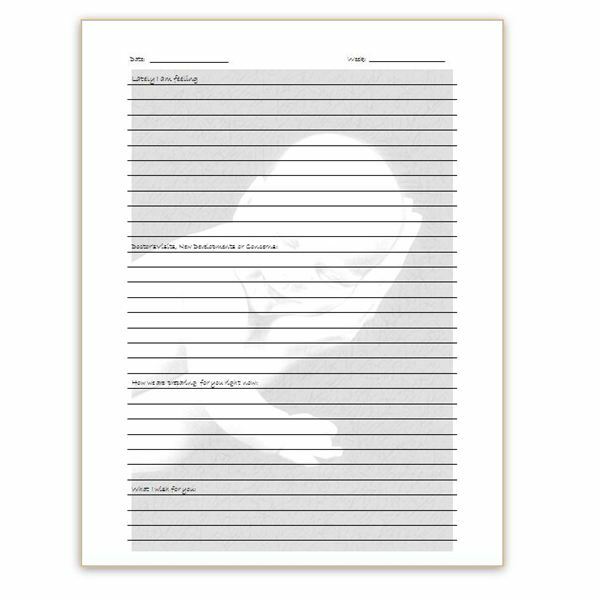 The tenth and final template offered is a pregnancy journal page so that expectant mothers (and fathers) can document their prenatal experiences. This diary page has a sweet, sleepy, smiling infant in the hands of a loving parent as the background. The foreground features lines on which to write the date and the week of the pregnancy, as well as sections for thoughts and feelings, doctor's appointments and preparations, and dreams and wishes for the coming little one. 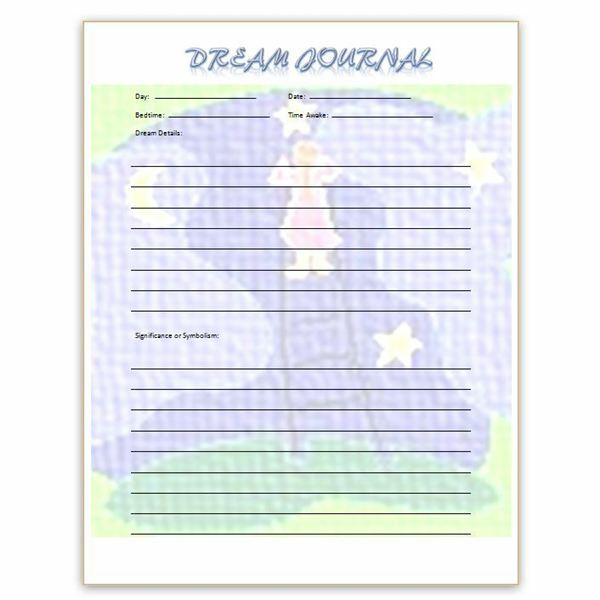 You may wish to zero in on just one of these pages or download several to create a custom diary. Either way, make journaling a priority and stick with it in order to reap the greatest rewards from the endeavor.